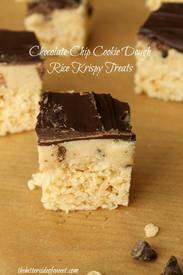 Chocolate chip cookie dough treats! These are deliciously addicting! They are sweet for sure and the combination was a surprise to all who tried them! I made them twice and twice had to send them away from the house! Happy National Chocolate Chip Day! Enjoy!